Use PVC pipe to create a decorative garden planter to display your flowers or vegetables. PVC pipe can be spray-painted and requires no maintenance. A simple, attractive three-tier design can be assembled in minutes using precut PVC pipe and fittings. Making a PVC planter is easy enough that young children can assist with the assembly. The affordability and widespread availability of PVC pipe makes using it for planters a practical alternative to more expensive wood containers. PVC pipe can be transformed into an affordable planter. Place a three-way corner connector on each end of the two 18-inch segments of pipe. Face the connector openings upward and toward the other segment. Place a 24-inch piece of pipe between each horizontal connector opening. Angle the resulting rectangle so that the 24-inch segment faces you. Place 12-inch pipes in the front two corner connectors. 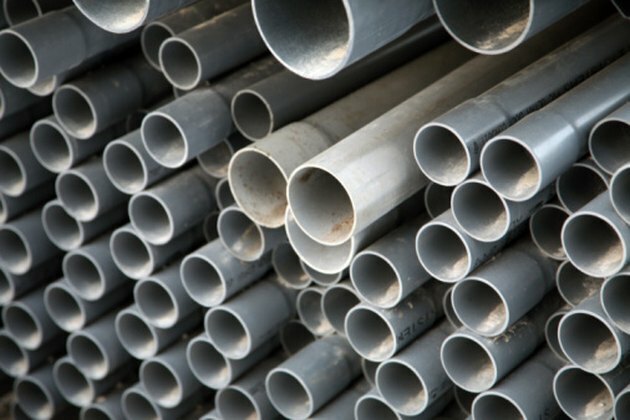 Place a corner connector on each 12-inch pipe so that one opening faces the opposite 12-inch pipe and the other opening lines up with the rest of the rectangle. Connect the openings that face each other with a 24-inch piece of pipe. Place a 6-inch piece of pipe in the other connector opening. Place a corner connector on its end. Face one opening upward and the other facing the opposite side of the planter. Connect the opposite sides with a 24-inch pipe. Place a 12-inch piece of pipe in the upward-facing connector opening. Place a corner connector on its end. Face one end of the opening toward the opposite side of the planter. Align the other with the planter base. Connect the two sides with a 24-inch piece of pipe. Place a 6-inch segment in the other connector opening. Place a corner connector on its end. Face one opening upward and the other facing the opposite side. Connect both sides with a 24-inch piece of pipe. Place a 12-inch pipe in the upward-facing connector opening. Place a corner connector on its end. Face one side toward the opposite side of the planter; align the other with the base. Place a 6-inch segment of pipe on the end. Place a 36-inch piece of pipe in the back corner connectors. Connect the top of the 36-inch pipes with the 6-inch pipes, using a three-way connector. Place a 24-inch pipe between the three-way connectors. Fill plastic window planters with soil and place them in the shelf trays, or cover the shelves with plywood cut to fit and place potted plants on top.